grass stains: Happy Valentine's Day! Earlier this week I was telling my friend Melanie that I was disappointed that Bakerella's Valentine's Day sweet treat was kind of "meh." I mean, the Butterscotch Cookie recipe itself sounded good, but I just couldn't get into the visual in terms of linking to it here on Ye Olde Blawg so that you all could feast your eyes on it. And since she usually only posts once a week, I thought that was it. But then yesterday she came through for us once again! 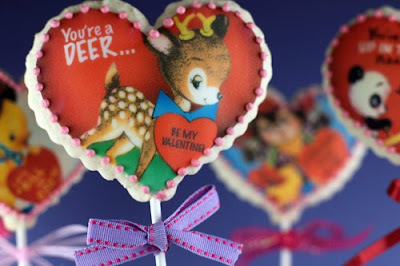 Vintage Valentine Cookies. So to the single girls out there who are perfectly content without a man, to the happily committed-to-someone people, to the happily married people, Happy Vintage Valentine's Day to you all!